If you’re kitting out a bedroom, choosing the furniture can be one of the most difficult parts. Luckily, Zest Interiors have a huge range of bedroom sets to offer! Whether you’re looking for the complete package or just want an item or two to furnish the room, our collection is sure to feature everything you need. Brightly coloured bedroom sets are ideal for children’s bedrooms and at our prices we’re sure you’ll love our range just as much as them! Pink beds and drawers are the ideal foundations for a princess themed room – we even offer a dedicated pink bedroom set for princess lovers! – while the unique Rampage car bed is perfect for a little boy’s room! If you’re looking for contemporary style you’ll love the Toro and Madrid bedroom sets. Available in black, white, black and white or white and oak, these collections add elegance and style to any bedroom without the high price tag you’d expect. 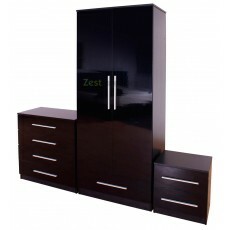 With various sized wardrobes, drawers and bedside tables to choose from, these bedroom sets cater for all requirements. For those that want a more muted, traditional wooden look, the Wyoming and Vegas sets are perfect. 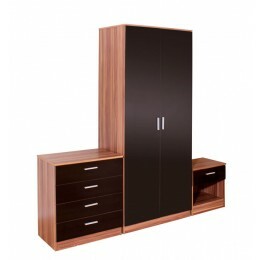 In Walnut and Beech respectively, these bedroom sets boast high quality and style without the demanding cost. Here at Zest Interiors we pride ourselves on providing a huge range of great quality furniture at discount prices, passing on the savings to our customers. Offering nationwide delivery on all our bedroom furniture including bedroom sets, there’s no need to go shopping anywhere else for top quality furniture. If you would like more information on any of our products please call our free Sales Hotline. The Madrid collection is a modern set of bedroom furniture in a stunning Black gloss front and Wa..
A modern collection of bedroom furniture in a stylish Two Tone White, the Madrid is a contemporar..
0 Comments To "A Wide Range of Bedroom Sets"